A relatively common bird, the pine siskin is often confused for other types of finches and sparrows because its field marks are not as striking as many other birds. Once you recognize these small but feisty birds, however, you'll better appreciate just how energetic and entertaining pine siskins can be. Markings: Both male and female birds look alike with heavy dark streaking on the white chest and abdomen and black and buff streaking on the mantle. The brown head also shows fine brown and black streaking. Thin, bright yellow bars show on the edge of the wings originating from a small yellow patch. Faint yellow or buff wing bars and yellow patches at the edge of the tail are easily visible. Pine siskin green morphs are rare and have the same markings but with a deeper greenish hue. On all pine siskins, the legs and feet are dark, and juveniles look similar to adult birds. They are omnivorous, and eat seeds, insects, larvae, sap, tree buds. Pine siskins can be found throughout the United States and Canada, and they are especially common along the Rocky Mountains and in the coastal areas of the Pacific Northwest all year round. Populations that breed in southern Canada will migrate to the central and eastern United States, though if food is abundant the birds may not migrate. Winter populations can also be found in northern Mexico. Pine siskins readily adapt to coniferous forests and suburban areas where cone-bearing trees are present. They are also found in weedy meadow habitats and along forest edges. These birds are generally nomadic within their range, and while they may be found in great numbers one year, the next year they could be nearly absent. They are prone to periodic irruptions as populations and environmental conditions change. For such a small bird, the pine siskin is very vocal. Calls include a high pitched rapid chittering as well as fast buzzing. These birds will be verbally argumentative to protect their feeding locations from other siskins, finches or sparrows. Pine siskins are agile, quick fliers that travel in both large and small flocks and can frequently be found in mixed flocks with American goldfinches and lesser goldfinches. They will feed on the ground beneath Nyjer and seed feeders, and backyard birds can become tame and accustomed to human presence. While feeding, they may even dangle upside down to access preferred seeds. When agitated, these birds react aggressively with a head forward threat display, possibly raising feathers on the head or opening the bill. If another bird is too close to a feeding perch, the resident pine siskin may even snap at or grab the intruder. Male and female birds have a monogamous relationship. The female will build a shallow nest of twigs, grasses, leaves and lichen, lining it with softer material such as fur, plant down or moss. The male does not usually help build the nest, but he may collect nesting material to offer the female. Both parents contribute to the care of the young. The eggs are pale blue-green and show darker red-brown spotting. Broods of 3 to 5 eggs require 12 to 13 days to incubate, and after hatching the fledglings remain in the nest for approximately two weeks. 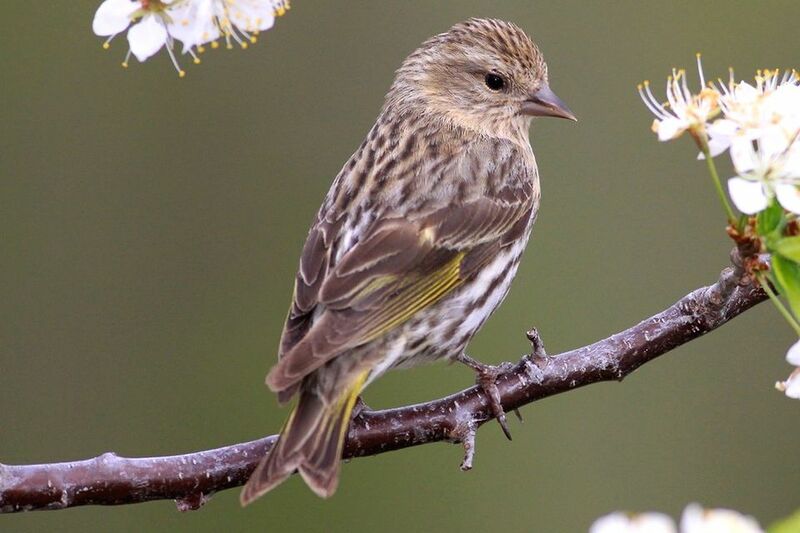 The female parent will incubate the eggs but both male and female birds feed the nestlings, and a pair of pine siskins may raise two broods per year. Pine siskins are vulnerable to brood parasitism by brown-headed cowbirds. These birds will readily visit backyards where an adequate food supply can be found. Backyard birders who offer Nyger seed in tube, sock or platform feeders, as well as offering black oil sunflower seed and a source of fresh water, will frequently be visited by pine siskins. These birds may also nibble at suet feeders. Yards with coniferous trees, natural weed seeds and seed-bearing flowers will also be attractive to pine siskins. Pine siskins are not considered threatened or endangered, but different population studies have shown steep declines in their numbers in recent decades. Because these finches travel in dense flocks, they are particularly vulnerable to diseases spread at bird feeders, and backyard birders should take great care to clean feeders regularly to minimize that risk. Feral cats and pesticide poisoning are also threats to pine siskins.